Our Suites sleep up to 4 ( 4 adults or 2 adults, 2 children ) Bedroom with two double beds, cozy Living Room with queen sofa-bed. They also feature a full-equipped Open kitchen, dining area. 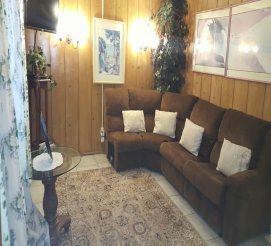 Other amenities include an LCD-HD TV with cable in both the living room and the bedroom, a DVD player, air conditioning and Ceiling Fan, free Wi-Fi Access. Patio with BBQ, Swing and Table and chairs. Suite A has a bedroom with 2 double beds, a queen sofa bed and a patio with BBQ, swing, and seating area with table alongside the creek. Suite B has a bedroom with 2 double beds, a king sofa bed, and a patio with BBQ, swing, and seating area with table alongside the creek. 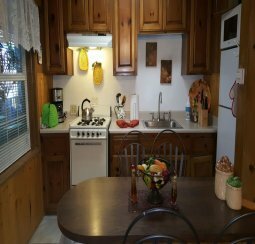 Suite C has a rustic wood interior with a bedroom with 2 double beds, Living room with Sectional and Sofa-bed, a recliner, and a wrap-around Covered deck with a seating area and beautiful Forest views. 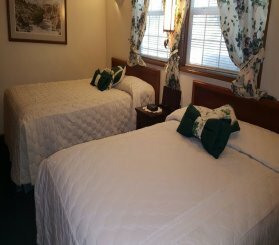 Suite D has a bedroom with 2 double beds, a queen Sofa bed, a recliner, and a Wrap-around Covered deck with Table and Seating area. Provides a beautiful view of the lush Forest.